The Henderson County Republican Women's Brunch will be held on Saturday, November 10th at Saint Patrick's Fellowship Hall north of Raritan. The 10:30 brunch will be served by the Raritan Baptist Church ladies. Reservations are to be made by Monday, November 5th. A silent auction of crafts, art, and baked goods will be held and anyone wishing to participate are asked to bring just one item or a set of items for the event. At the meeting the first Republican "Woman Of The Year" will be announced. The featured speaker and special guest for the event is Mrs. Jodi L. Scott, the current Regional Superintendent of Schools for Henderson, Mercer and Warren Counties. Mrs. Scott will be speaking on "Education, The Future." Mrs. Scott was born and raised in Henderson County, from a family of five. She is a Union School graduate, and Western Illinois University graduate with a B.S. Degree in Elementary Education. Mrs. Scott taught at Union Elementary School in the Pre-Kindergarten Program from 1992 through 2000. She earned her Masters Degree in Early Childhood Education at WIU then began employment with the Regional Office of Education in the summer of 2000 as an Educational Consultant. That same summer she earned her certification in Administration. She was appointed Assistant Regional Superintendent of Schools in 2004 and most recently, Regional Superintendent of Schools in June of 2007. She is currently working on her PhD at the University of Illinois at Champaign-Urbana. Mrs. Scott spends her time with her loving husband Tony, also from Henderson County, and her two daughters Allison in third grade, and Andrea in sixth grade. She enjoys reading and attending her children's extracurricular activities. She enjoys listening to her children sing as members of the Carl Sandburg Children's Choir and volunteers as a coach with the Midget Youth League Softball Team. The family maintains a home in Media, where her brother lives and they recently built a cabin on the river in Henderson County to nurture great family memories with the Mississippi River. Mrs. Scott is passionate about education and has dedicated her life to making a difference for all children of the entire region of the Henderson, Mercer and Warren Counties ROE 27. 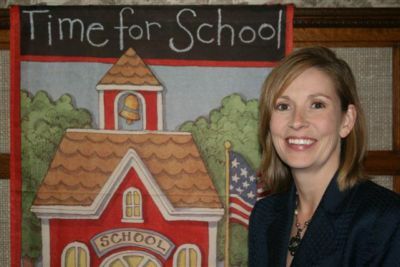 Jodi Scott Regional Superintendent Of Schools, will speak on "Education-The Future"